According to reports from Digisport, Arsenal have agreed on a deal as they sign highly rated midfielder Catalin Carji. Viitorul Domnesti midfier will be joining the club in December after he turns 16. However, official confirmation of the player won’t be happening as Carji will be joining Arsenal as a scholar but the player took to his Instagram page to make his transfer to Arsenal known. In an interview with Digisport, the player expressed how exited he was going to the London Colney stressing on how highly the club thinks of him and suggests a promotion to the first team in two-year time. When Arsenal sees a talent, they know and always utilise the opportunity and will be keen in making sure they sign the player, especially talented youngsters. 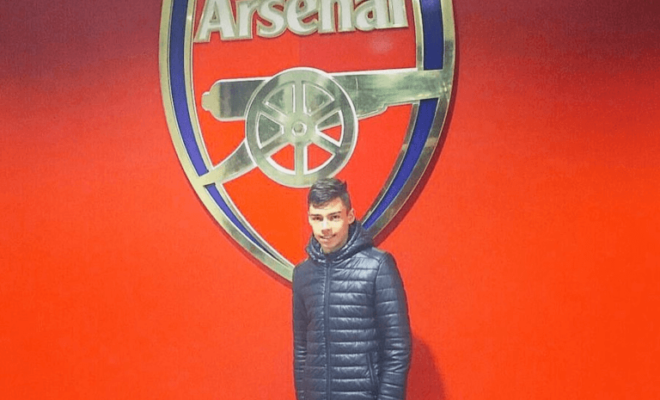 The 15-year old is said to have outdone himself as he has feature in friendlies matches for Arsenal and he has already set in after he was given a tour of the Hale End Academy. It is hoped that after Carji turns 16, he plays his part and in making sure he gets featured in the first-team as promised. It doesn’t too far from being impossible as Arsenal players Alex Iwobi and Hector Bellerin were also promoted from the youth football to make the first-team.